THE PEARL is making a comeback in the world of high fashion jewellery and the South Pacific black pearl is a major new player. The black-lipped mother of pearl shell Pinctada margaritifera is a native of the South Pacific and thrives in the clear, unpolluted waters of the lagoons of the Northern Cook islands of Manihiki and Penrhyn. The Cook Islands has built a new and thriving industry out of this interest in the black pearl. The cyclone in Manihiki of November 1997 was a serious setback but the pearl companies have begun the process of reconstruction. Black pearls derive their lustrous color from the greyish-black nacre of the oyster shell. There are many different shades of black. Color is not usually a factor in determining price. Growing pearls is a highly skilled process. First, the oyster is collected and a trained technician puts a nucleus into the shell as well as a piece of mantle from a donor shell. The nucleus is a tiny sphere of crushed Mississippi freshwater clam specially farmed for the purpose. The mantle is the part of the oyster flesh which lays down the mother-of-pearl coating, the nacre. The mantle creates a pouch around the nucleus and, over two years or so, puts thousands of very thin layers of nacre over it. The result, if perfect, is a perfectly spherical black pearl. Pearl seeding technicians are highly skilled. Most are Japanese and are booked up for years in advance. They are probably the highest-paid workers in the world, the best of them earning over a million dollars a year. To help them withstand the stress of the implant operation the mother shells have to be kept in good condition and this entails cleaning them constantly to prevent the build-up of algae and barnacles. 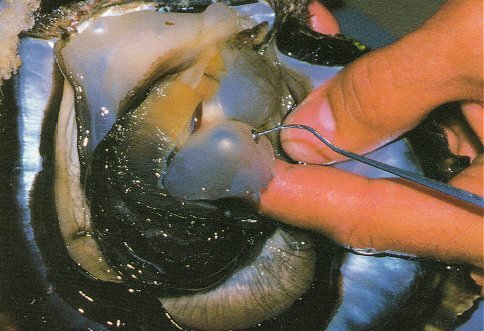 This is the most important and time-consuming part of pearl farming. The price of a pearl depends on its quality and size. Pearls are graded by size, shape, surface characteristics, color and lustre. Size is in millimetres ranging between 8 and 12 with the occasional rare beauty reaching 13 to 15 millimetres. Surface characteristics can include surface blemishes such as pits, bumps, ridges, cracks and spots. Color is a matter of taste: it can range from deep black through silver grey and into white. Lustre is caused by the reflection of light from the surface. Shape can be classified by round, drop or pear, button (round one side and flat the other), baroque (irregular) and circled (ringed). Keshi pearls are formed when the mother pearl shell rejects the nucleus and only the donor mantle remains. The shell then forms a small, irregular seedless pearl. Mabe (mar-bay) pearls, also known as blister pearls, are half-pearls formed by cutting the nucleus in half and attaching it to the inside lip of the mother shell. They form oval, teardrop and heart shapes and often show the colors of the spectrum. There is another extremely rare pearl to be found in the Cook Islands: the natural Golden Pearl (poe pipi). This is one of the few remaining types of natural pearls left in the world today. It grows in the lagoon of Penrhyn in the shell Pinctada maculata, the smallest pearl producing shell in the world. The pearl is seldom bigger than 8mm in diameter.